Immerse yourself in the world of the Marvel Universe's most dangerous assassin as acclaimed writer Greg Rucka takes Elektra Natchios - a woman trained in the ninja arts by both the Chaste and the Hand, the epitomes of purest good and foulest evil - on a soul-searching journey into her own mind. 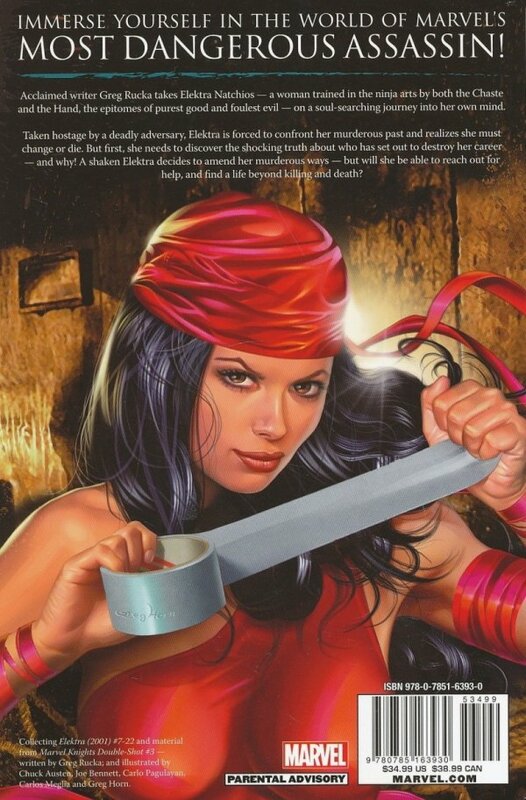 Taken hostage by a deadly adversary, Elektra is forced to confront her murderous past and realizes she must change or die. But first, she needs to discover the shocking truth about who has set out to destroy her career - and why! A shaken Elektra decides to amend her murderous ways - but will she be able to reach out for help, and find a life beyond killing and death? Collecting ELEKTRA (2001) #7-22 and material from MARVEL KNIGHTS DOUBLE-SHOT #3.